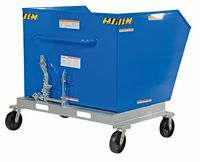 Portable Steel Hoppers, series P-HOP make handling waste and bulk material safer and more convenient. Fork truck entry openings are designed to move hopper over rough terrain. Usable fork pockets are 7" x 2" on 21-5/8" centers (11-5/8" fork pocket center for ½ cubic yard capacity model only). Foot operated caster lock is included. 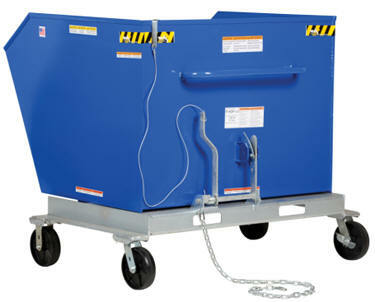 A cable operated from the seat of the fork truck manually dumps the Hooper. Units must be attached to fork truck when dumping. Handle for transporting. Welded construction makes them durable. 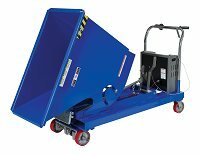 Blue baked-in powder-coated toughness with galvanized base. Optional model PLID-H heavy duty poly lids, model LEKP welded leak proof seams, model H-DPLG-75 ¾” drainage plug or H-DPLG-2 a 2” drainage plug, leak proof seams included with drainage plugs. of Steel Volume Cubic Yards Wt.